Increasing requests for loans from WELS Home Mission churches and mission-minded congregations is prompting WELS Church Extension Fund (WELS CEF) to offer special rates for new investors. WELS CEF makes loans below or at market rates for WELS churches that are either new and building for the first time or established congregations with a new mission-focused initiative. WELS CEF funds these loans through WELS congregations’ and members’ investments in WELS CEF products. With the need for funds increasing, WELS CEF, through this special offer, is seeking to raise approximately $12 million in investments. “If you are not an investor in WELS CEF, this is a great opportunity to support ministry. If you are already an investor, this is a great opportunity to increase your support of ministry by increasing your investments,” says Mr. Scott Page, director of WELS CEF. For a limited time, WELS CEF is offering a four percent interest rate on a minimum investment of $5,000 in either a 56-month-term loan certificate or a 60-month-term IRA certificate. WELS CEF’s investment certificates pay and compound interest quarterly. The four percent interest rate applies only to new money investments. View rates online at wels.net/cef. New IRA investors should contact WELS CEF at 866-511-7793 for investment materials. Investors can also manage their accounts and investments online. At its meeting on Feb. 22–23, the Synodical Council approved the ministry financial plan (budget) for 2019–2021 that will be recommended to the synod convention in July. In the first year of the biennium (2019–2020), the plan calls for a small increase in the synodical support portion and in the overall spending levels (which include support from special funds, gifts, tuition, and fees). In the second year of the biennium (2020–2021), there is a small increase in synodical support and a small decrease in the overall spending levels. The Synodical Council will continue to monitor the financial situation; changes could be made prior to the convention if circumstances require. The Synodical Council approved several adjustments to spending for the current year, with all approved projects funded without additional synodical support. While 2019 Congregation Mission Offering (CMO) subscriptions pointed toward a one percent decrease from 2018 actual offerings, CMO results through the end of February are very encouraging. February’s CMO totals were 6.8% higher than a year ago, and year-to-date totals are 6.6% higher than the previous year at this time. We thank God for his blessings and for the gifts of his people. Congregation Mission Offerings (CMO) received in 2018 totaled $21,111,878. We are grateful for this generous support our synod’s mission and ministry. The total, however, was $246,000 (1.2%) below the offerings received in 2017 and $148,000 (0.7%) less than what congregations had indicated in their CMO subscriptions for the year. More than a decade of flat, and now even decreasing, CMO has made it increasingly challenging to maintain our current level of ministry, not to mention to seize some of the many gospel opportunities that God is graciously placing before us. Adding to that challenge is the fact that subscriptions for 2019 are $20,913,700, nearly 1% less than 2018 receipts. Since our planning forecasted that subscriptions would be met in 2018 and that subscriptions for 2019 would increase by 0.5%, the task to maintain and expand ministry has become even more difficult. The results for 2018 and subscriptions for 2019 are $350,000 less than the forecast and compound to reductions from what was used for planning the next biennium of $454,000 and $456,000 for Fiscal Year 20 and Fiscal Year 21, respectively. One bit of good news is that offerings for January 2019 were 6.4% higher than the January offerings in 2018. At its meeting later this week, the Synodical Council will be looking to adopt a Ministry Financial Plan that recognizes these financial realities. All areas of ministry have been asked to look for ways to economize and to plan for less spending than what had been anticipated. Once a plan for the next two years is adopted by the Synodical Council, it will be forwarded to the synod convention this summer for approval. As the economy improves, we pray that God will enable congregations to meet—and even exceed—their CMO subscriptions in 2019. On Sept. 20, 2017, Hurricane Maria swept over the island of Puerto Rico causing great devastation and destruction. WELS members responded generously with gifts to WELS Christian Aid and Relief. But the devastation caused by the storm made communication with fellow Christians in Puerto Rico difficult. It was hard to know what needed to be done to help and how that help could be delivered. Early last summer WELS Christian Aid and Relief sent retired missionary Rev. Larry Schlomer Sr. to the island. He was asked to stay for up to a year to help the church leaders determine what needed to be done and then to help organize relief and rebuilding efforts. God has graciously taken care of the people of the Evangelical Lutheran Church of Puerto Rico and restored their church in Humacao. On Feb. 10, 2019, this church celebrated the completion of the rebuilt church with a dedication service. Many of the national pastors were in attendance along with Rev. Larry Schlomer Sr., WELS President Rev. Mark Schroeder, and Rev. Tim Satorius. View a slideshow of the dedication service. The development of the new WELS hymnal and its supplementary products is making significant progress this year in anticipation of the final release scheduled for Advent 2021. A preview of the new hymnal will be available in 2020. The Executive Committee of the Hymnal Project reviews and finalizes all content. Several specialized subcommittees lead the design of certain elements or worship resources that serve the specific needs of churchgoers, musicians, and pastors. For example, the Hymnody Committee evaluates which hymns to include in the new hymnal. Similarly, the Psalmody Committee is completing the text of the Psalter, a resource containing the full text of all 150 psalms with multiple musical settings for each. Other subcommittees focus on rites and Scripture as well as the technology for and communication of the project. The pew edition of the new hymnal will be designed to make the text and music on the page clear and intuitive for all worshipers. Separate accompaniment editions for liturgy, psalms, psalter, and hymns will provide a robust resource for organists and pianists. Three settings of the main communion service will be included in the hymnal pew edition, each following similar worship structures while varying the musical style. Several additional musical settings are in development and will be made available digitally. In addition to performance guidelines like tempo markings, the “Accompaniment for the Hymns” edition will include additional musical options for many hymns. A team within the Hymnal Project called the Musicians’ Resource Group is gathering even more arrangements for other instruments not included in the accompaniment edition, such as brass, flute, and guitar. After four years of development, the updated lectionary for the new hymnal was recently completed. Each Sunday, the three Scripture readings, Prayer of the Day, Psalm of the Day, and Verse of the Day will now fall under one theme. The new Commentary on the Propers will help leaders plan their worship around these integrated service themes. If you would like to learn more about the Hymnal Project and stay up to date on its continued progress, visit welshymnal.com and subscribe to the e-mail newsletter. The COP will work with the Commission on Congregational Counseling to develop guidelines for congregations that are beginning the process of closing or merging. Guidelines will be made available upon request from the district president. The COP is developing a tool to assist congregations that are exploring alternative approaches to congregational structure and polity. The COP expressed support for the plans of Congregational Services to offer two programs to replace Mission and Ministry Sunday in fall 2019. One program, the 10 for 10 stewardship program, will offer a ten-week emphasis on whole life Christian stewardship. The work we do together as a synod will be highlighted as one part of the program. The other, the Welcome Home initiative featuring a “Welcome Home Sunday” on Oct. 27, will help congregations to seek to regain those who have strayed from active congregational membership. The COP expressed support for a WELS National Conference on Lutheran Leadership being planned by Congregational Services for Jan. 21-23, 2020, in Chicago, Ill. The conference will emphasize leadership that is rooted in the beliefs of confessional Lutheranism. The COP discussed the importance of encouraging congregations in their efforts to increase Congregation Mission Offerings (CMO). The continuation of vital synodical ministries depends on increasing CMO support from our congregations. The COP has begun an effort to review the synod’s bylaws dealing with discipline of called workers and congregations, as well as the appeals process. The COP will complete its work in time for the revised process and bylaws to be reviewed by the 2020 district conventions. The COP Doctrine Committee will schedule regular meetings with the Doctrine Committee of the Evangelical Lutheran Synod and with the faculty of Wisconsin Lutheran Seminary. The COP expressed support for plans to form an Institute of Lutheran Apologetics (defending the Christian faith and teachings). The COP reviewed the pastoral vacancies and noted that the overall vacancy rate has remained about the same since its last meeting. The COP expressed its support for an effort by Congregational Services to assemble a “Rural Ministry Task Force” that will provide ministry resources for rural and small-town congregations. A special committee is studying the issue of the calling window for teachers. Currently the calling window runs from November 1 through the first week of June. The committee is considering a change in the window, moving it to the first Sunday in October through the first Sunday in April. The COP was asked for input and indicated that it would approve of such a change if proposed. The committee has not yet made a final decision. It will continue to seek input and will bring its recommendation to the COP at a future meeting. About 20 leaders of the Evangelical Lutheran Synod (ELS), the Lutheran Church—Missouri Synod (LCMS), and the Wisconsin Evangelical Lutheran Synod (WELS) met in Florida on Nov. 27-28 to continue the informal discussions begun in 2012. At this seventh annual meeting, participants updated each other on news from their respective synods. They also spent time discussing the doctrine of creation and its relation to science—a topic about which they found themselves in agreement on the key issues. Looking ahead to the future, participants debated whether or not it is proper to begin formal doctrinal discussions with a view to restoring fellowship between ELS/WELS and the LCMS. Given the issues that separate us, it was decided that such a move would be premature at this time. Rather, the group decided to continue with informal discussions, with another meeting planned for December 2019. At this meeting, the group will discuss the doctrine of justification. They also will precisely articulate and commit to writing some of the specific points of controversy between our synods. These intersynodical discussions, conducted outside of the framework of church fellowship, have been useful in clarifying our synodical positions and in sharing information on topics of mutual interest. This latest meeting was no exception. Many participants expressed gratitude for the opportunity to get together and to keep the lines of communication open. Representatives of the Wisconsin Synod, the Evangelical Lutheran Synod, and the Lutheran Church–Missouri Synod will meet Nov. 27 and 28 for another in a series of annual informal doctrinal discussions. These meetings have proven to be beneficial in helping the three synods better understand the doctrine and practice of one another. The meetings have opened lines of communication between the leaders of the three synods and between various groups such as those responsible for world mission efforts. The meetings have also been beneficial in providing mutual encouragement to stand firm in the areas where there is full agreement. 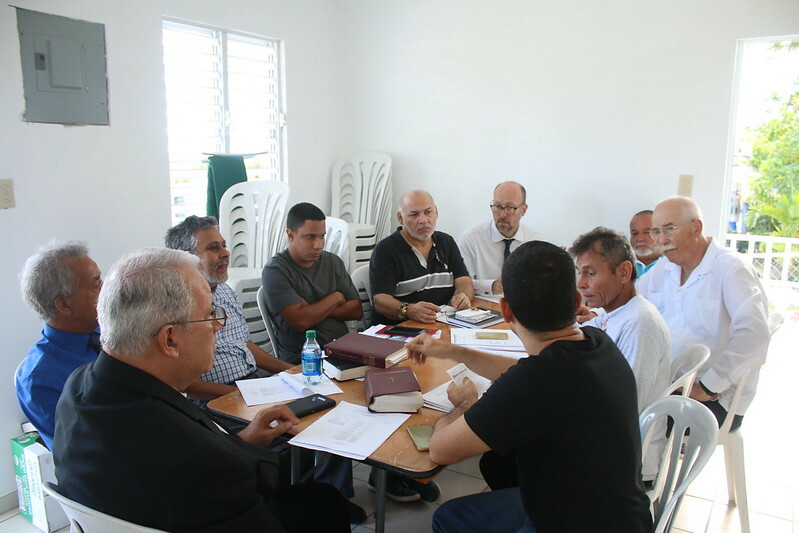 In previous meetings the group has focused on various areas of doctrine and practice, working to identify where we agree and where disagreements remain. Topics discussed in the past have been Church and Ministry, fellowship, the role of men and women, and principles that guide the interpretation of the Scriptures. The main focus of discussion for this year’s meeting will be to identify, from each synod’s perspective, what issues would need to be resolved—on the basis of Scripture—for fellowship to be possible. These discussions have been termed “informal” to avoid giving the impression that they will result in a re-establishment of fellowship in the near future. Any restoration of fellowship would be possible only when the three synods are in full agreement in doctrine in keeping with the Scriptures. Even though fellowship might not be possible now, the informal discussions will continue because of the benefits and opportunities they bring.